Lima Senior’s Talor Washington goes up for a shot against Tinora during Friday night’s Vicki Mauk Holiday Classic championship game at the Elida Fieldhouse. ELIDA — Lima Senior’s girls look pretty comfortable inside the confines of the Elida Fieldhouse. For the fifth straight year Lima Senior came home with the championship of the Vicki Mauk girls basketball tournament with a 69-47 win over Tinora in the championship game Friday at the Elida Fieldhouse. Elida defeated Lima Central Catholic in the consolation game 47-39. Tinora went out to a quick 13-11 start after the first quarter. From there, Lima Senior’s zone press locked in and it was all rebound, run and drive to the hoop. The Spartans outscored Tinora 13-0 in a second-quarter burst and grabbed a 33-22 lead at the half. It was all Spartans after that. 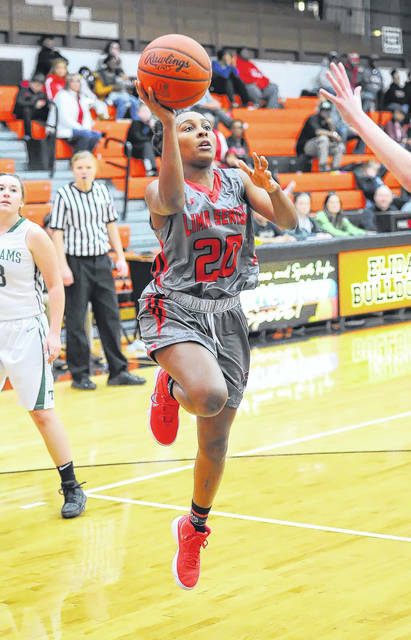 Lima Senior (6-5) was led by the driving of Destiny McDonald, who had 23 points, including 14 at the half. “I was going to keep doing it (driving to the basket) until they stopped me,” McDonald said with a laugh. Freshman point guard Nakiya Sigman had 15 points, five assists and four rebounds. It was her sixth game back from missing the first five games with a knee injury. Six-foot freshman Cheyanne Bean had 10 points and 10 rebounds. Latoine Cowan had 11 points and three 3-pointers. Talor Washington had eight points and eight boards. Named to the all-tournament team were Lima Senior’s Sigman, Bean and McDonald. Joining them on the all-tournament team were Elida’s Shyah Wheeler and Tinora’s Sarah Harris, who scored 17 in the championship game. Minster has won the most Vicki Mauk tourneys with nine. Lima Senior is second with five, including the last five tournaments. Lima Senior opened up the third quarter with an 11-5 run to pull out to a 44-27 lead. Sigman scored nine of her points in the third quarter to help clinch the win. Many of those came on weaving, spinning layups through traffic. Lima Senior won the boards 38-32. The Spartans’ pressing defense forced 24 Tinora turnovers. Every time Elida needed a big play, Shyah Wheeler was there to deliver. Wheeler tossed in 28 points with 15 rebounds to power the Bulldogs to a victory over LCC. “We actually grew up a little bit because I don’t think we could have overcome that (a late LCC surge) before,” Elida coach Chrissy Billiter said. Elida led 28-18 at the half and 38-29 after three quarters. LCC rallied behind fourth second-half 3-pointers by freshman Mary Kelly Mulcahy. Mulcahy’s fourth 3-pointer brought LCC within 38-34 with 5:55 to go. Elida didn’t panic, however, and continued to get LCC in traps, at three-quarters and half court. Wheeler hit a 7-footer and two free throws and the Elida lead went back to 43-36 with 2:34 to go. Josie Mohler led LCC with 14 points and 14 rebounds. Mulcahy had 12 points on four 3-pointers. Jessica Wilker had six points and four rebounds. Rosie Williams had four points and seven boards. Hayleigh Bacome had six points for Elida. LCC won the boards, 47-40. Elida is 2-7. LCC is 0-11. Wheeler started in a shooting rhythm and rolled in the first half. By halftime she had 18 points and 10 rebounds. This entry was tagged Elida, limacentralcatholic, limasenior. Bookmark the permalink.